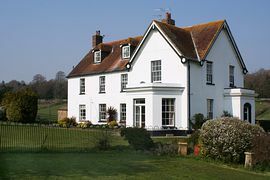 We welcome you to stay at our family run, attractive Georgian Farmhouse B&B, situated on the edge of the historic town of Blandford Forum. 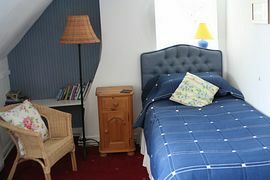 Our rooms are spacious, peaceful, with rural views from every window; we have wireless Internet access throughout the house, with TV/DVD and hospitality trays in each room. We have safe off-road parking. 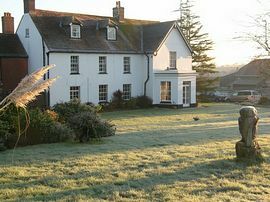 A full farmhouse English breakfast is our speciality. Our location is superb; in the heart of the country yet only 10 minutes walk to the town centre and its amenities, which include several restuarants and a leisure centre, with indoor heated pool. We are in a fantastic location for exploring the diverse county of Dorset; it has a beautiful coastline, as well as stunning countryside and fascinating villages. Bryanston School and Blandford Camp are just 5 minutes drive away; Clayesmore, Knighton House and Milton Abbey School are between 10 and 20 minutes drive away. 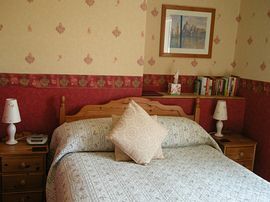 Double and Twin Rooms: £60.00 per room per night. 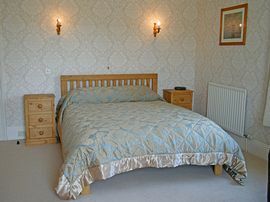 Family room: £60.00 per 2 people sharing per night. 0-4 years: £5 per night. 5-12 years: £10 per night. 13-16 years: £25 per night. Additional adults: £30.00 per night. We are closed for Christmas and New Year. Pet Facilities: Pets are allowed. We do not allow pets in the house, but if the owners are happy to leave them in the car overnight, then they can. Special Diets Provision: Special diets are catered for. Notification in advance of specific dietary requirements. At the second mini-roundabout, turn left. After a short distance turn right towards Winterborne Stickland. The farm is 300 metres up the road on the right.